I've installed MoreGallery, how do I create a new Gallery? MoreGallery installs itself as a custom Resource, so to create your first gallery you will need to create a new Gallery Resource. To do you can right click anywhere in the tree, choose Create in the context menu, and then choose Create a new Gallery Here. After saving the resource a first time you can start adding images. Also have a look at the MoreGallery User Guide for more information on managing galleries with MoreGallery. Can MoreGallery automatically import IPTC image data on upload? It indeed can! When you upload an image with IPTC data embedded, it will prefill the image information immediately. In v1.3 this only happens for the name, as of v1.4 this has been extended to also automatically fill tags. For the name, MoreGallery will look at the Caption, Headline and DocumentTitle IPTC data where the latter takes priority. For tags, it will combine all values from the Category, Subcategories and Keywords IPTC values. Read more about how you can use the IPTC data here. What Gallery script can I use with MoreGallery? Can I manage video with MoreGallery? Yes you can! We added support for YouTube and Vimeo videos in MoreGallery 1.5. In the gallery, you just click Add Video and paste in the link. MoreGallery will then automatically load a thumbnail for the video, as well as the title and description. For MoreGallery versions before 1.5 we used to suggest the following work arounds. Both work arounds require that you first upload an image thumbnail/placeholder before adding the video link. In MoreGallery 1.4 you can add Custom Fields to contain your video embed code or file url. Older versions can reuse the URL/Link field to specify a link to the video. How do I save tags? They don't get saved when I type them in. After typing in a tag, you will need to hit return or the Add button. This will save the tag automatically. You can see the tag is visually separated from the textfield when it is properly saved. Can I access EXIF or IPTC data in my gallery? Yes, you can! For instructions on how to access these values as of MoreGallery 1.4, please see Dealing with EXIF data and Dealing with IPTC data in the documentation. Can I regenerate the manager thumbnails or all crops automatically? This shouldn't be a common occurrence, however if you have a need for all thumbnails or crops to be regenerated with the default settings, you can do that (since v1.4). We don't expose this in the interface, but if you edit the modx_moregallery_image table and empty the mgr_thumb value, that will be regenerated the next time the image record is requested. You can also remove the thumbnail files (located in a _thumbs directory below your gallery directory) to get the same result. Please note that regenerating all thumbnails can take some time. In some cases with large galleries it might even time out the request. Just keep refreshing the list in the manager or frontend several times for a large gallery to be completely regenerated. To regenerate crops to the defaults, you'll need to remove the records in the modx_moregallery_image_crop table. They will then be regenerated according to the default configuration. How can I have multiple galleries on one page? If you're using the single image view provided by the mgGetImages snippet, you might run into issues when there are multiple galleries on the same page. By default they all share the same url parameter, iid, so that might affect multiple galleries at the same time. To fix this, you can specify a different url parameter per mgGetImages snippet call using the &singleImageParam property (introduced in v1.4). If you're not using the single image view, you can disable it by adding &singleImageEnabled=`0` to the snippet. If you're using getPage to paginate multiple galleries on one page, you can also provide the getPage &totalVar and &pageVarKey properties to ensure the pagination is isolated per gallery. I don't want to use the wrapperTpl chunk if there are no results. How do I do that? As of v1.4, you can specify &wrapperIfEmpty=`0` on the mgGetImages or mgGetTags snippet call to return an empty result if there are no (matching) images/tags. Prior to 1.4, you could add a conditional wrapper based on the [ [+tag_total] ] or [ [+image_count] ] placeholders. MoreGallery says my license is invalid. What do I do? It's fairly common to receive the invalid license warning, typically after moving the site from development to production, or if there are file permission issues causing it to be unable of writing the license file. When following the provided "Fix my license" link, after logging in to the associated user account, you will be provided with more details as to the exact reason the license is considered invalid. There will also be one or more options available to resolve the problem, typically including choosing a new license or transferring a license from an old to the new domain. As soon as the license issue has been resolved, your site will automatically download the new license key, and the warning will disappear. If you need help dealing with the invalid license, please send us an email. We'd be happy to help! If you've just installed MoreGallery, or updated from an earlier release, it's possible to get the error "using an old version of Alpacka" when setting up your front-end with the mgGetImages snippet. To resolve this issue, the used version of Alpacka needs to be updated. Alpacka is a shared library of common code used across our extras. You can read more about it in our initial introduction here. 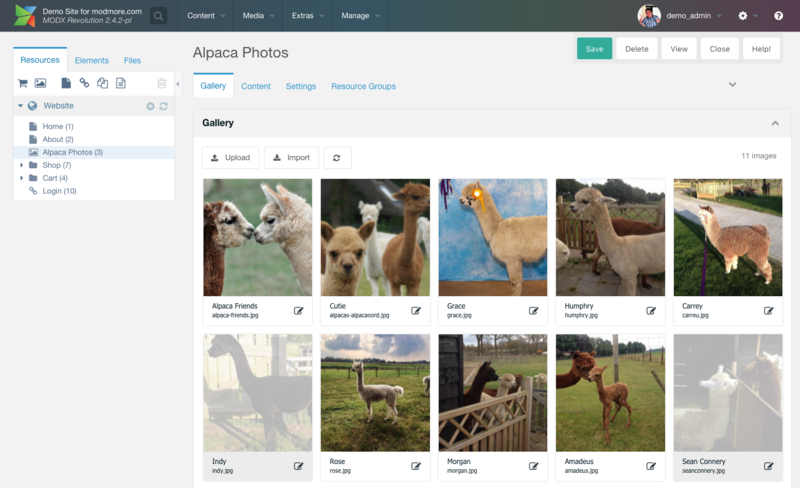 Alpacka is a dependency to many of our extras, including MoreGallery, ContentBlocks and SimpleCart. However because Alpacka is actively developed, sometimes different versions may be used in those extras. This can cause issues as only one version of Alpacka can be in memory at the same time, so that may be an older version than required. That's where the error using an old version of alpacka comes from. Make sure all modmore extras are up to date. In particular MoreGallery, ContentBlocks and SimpleCart. There's also a standalone package called Alpacka which should be installed automatically as of MoreGallery v1.5. If that's not there, or out of date, you can download it from the modmore.com provider (it's a free package). SimpleCart prior to v2.4.3 is known to sometimes conflict with MoreGallery 1.5. If you're unable of resolving the error simply by updating our extras, please contact us at [email protected] with access to your site, and we'll investigate the cause of the version conflict and help get you back on track. How can I share images across multiple contexts or translations? If you need to show the same images on different pages across different contexts, you can use the mgGetImages snippet with the &resource property. This property allows you to specify the resource to retrieve the images from. Are you also using the Single Image View? If you want to make sure links to view the specific image point to the context the visitor is in, you'll also need to specify the &singleImageResource property. A description of each property can be found in the mgGetImages documentation. How can I set gallery specific media sources, paths, or other options? On the Settings tab of a resource you can set the Media Source, Relative URL, Content Position, Crops and Custom Fields. By default all of these are set to "inherit", which makes it read the appropriate values from the context or system settings. After changing a value, it may be necessary to reload the page for changes to take effect. How can I show all images in a gallery, except the first? The limit property is also necessary. If you want to show all images, set the limit to a really high number, as setting the limit to 0 does not work with an offset. The downside of this approach is that it may not work as expected if the image with sortorder 1 is marked as hidden/inactive. Is it possible to hide the tags box when that's not used? Yes. The tags require a permission, which you can configure appropriately. The permission for tags is moregallery_image_tags (located in the MoreGallery policy template). Similarly, permissions exist for other functions, like importing files or adding videos. The gallery can even be completely disabled, or made read-only, through the permissions. Learn how to set up permissions in the documentation. Does MoreGallery support uploading SVG or PDF files? Yes, you'll need to update a few settings in MODX and make sure the imagick extension is available. In your system settings, add svg and pdf to the upload_images system setting, if they're not already listed. Next, in the media source you use with MoreGallery, also add them to the imageExtensions property. That should allow you to upload SVG and PDF files into a gallery. For the cropping to work with SVG and PDFs, you need the imagick extension for PHP. It is common, but not always available. To see if imagick is installed, go to Manage > Reports > System Info in the manager and click on phpinfo(). Do a search on the page (ctrl/cmd+f) for imagick. There should be a full block of information including versions and supported formats. If that's missing, then you don't have imagick installed, and you should reach out to your host or server administrator. For standard image files (png, jpeg, gif), the gd extension is sufficient, which is installed on virtually all servers. Note that SVGs and PDFs are transformed into PNGs for the manager thumbnail and crops you define. In some cases, especially with optimized SVGs, this may actually make the thumbnails larger in filesize. You can consider building specialized markup for your SVGs for such cases, which applies the scaling to the source image directly. At the moment, the only rotation is built in to the file upload. This looks at the EXIF data embedded in an image to see what the orientation of the camera device was when the photo was taken. MoreGallery does not currently have image options to manually rotate images. What video sources are supported? MoreGallery supports embedding videos from YouTube and Vimeo. If you'd like it to support other video sources, please let us know.